After lagging behind other countries for decades, France is working on a new national plan for autism. Behind the brightly colored walls of FuturoSchool’s main hallway, in a small, cozy cubicle, Samy Sajidi is meeting with his counselor. Sajidi has autism and attends the school part-time. Since November 2016, he has also worked as a sales assistant at a clothing store — and so far, he tells his counselor, the job is going well. It’s 3 p.m. on a Wednesday in October, and there are just four students present, including Sajidi, 27 — because this is no ordinary school. 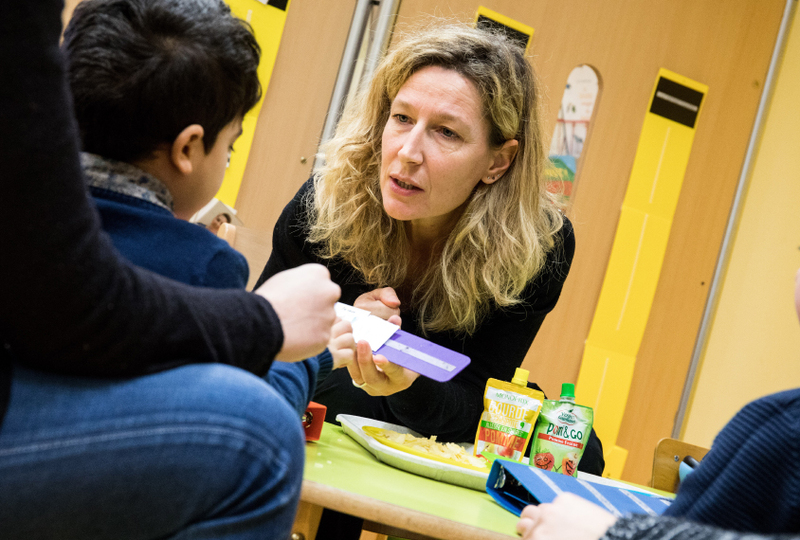 Occupying a modest space on the first floor of a quiet residential building in Paris, FuturoSchool is among the first schools in France to focus on providing applied behavioral analysis (ABA) for people with autism. Its eight other pupils, who also receive occupational therapy and speech therapy, are in lessons at nearby mainstream schools or away at activities such as music classes, swimming or judo. After their session is done, Sajidi and his counselor step out of the cubicle and walk toward an open space in the center of the school. It’s filled with colorful equipment: giant exercise balls, gym mats, a ball pit. Sajidi and his counselor pick up tennis rackets and hit a ball back and forth, their laughter floating across the room. Sajidi’s days weren’t always so lighthearted. When he was just 2, he was diagnosed with ‘childhood psychosis.’ Instead of starting nursery school, he spent his days at a psychiatric ‘day hospital,’ where he attended sessions with a psychoanalyst. “It was a disaster,” says his father, M’hammed. Over time, Sajidi became increasingly violent toward others and harmed himself. When Sajidi was 10, his father stumbled upon an article online in which a Canadian couple described the behavior of their son with autism. “It was like they were recounting the behavior of my son,” he says. He and his wife spent more than six months looking for a child psychiatrist who would change their son’s diagnosis to autism. With that new diagnosis, they took their boy out of the day hospital and enrolled him in a mainstream school for two hours a week. It took another four years before Sajidi’s parents learned about ABA and found professionals to work with him — at which point his behavior started to improve. That transformation led to FuturoSchool, which Sajidi’s father founded in 2004. Soon, other parents with children on the spectrum offered funding to expand the school. It took five years before the government recognized the organization as an experimental public school. In 2016, the government removed the school’s experimental label and granted it 15 more years of funding. Sajidi is now 90 percent independent, thanks to the continued behavioral interventions he has received, according to his father. But almost every day, M’hammed Sajidi says, he meets parents still trying to get an autism diagnosis and therapy for their child. He shakes his head. “That’s not normal,” he says. France lags about four decades behind countries such as the United States and the United Kingdom when it comes to diagnosing and treating autism, says Danièle Langloys, president of the advocacy group Autisme France. Like Sajidi, many young people with autism are not identified early, when they stand to benefit the most from behavioral therapies — although rates of early diagnosis have improved over the past decade. Some people with the condition are never identified. One 2015 study pegs the prevalence of autism in France at 0.36 percent, well below the 1 percent reported in the U.K. and roughly 2.5 percent reported in the U.S. Among children who are diagnosed with autism, only about one in five attends a mainstream school. 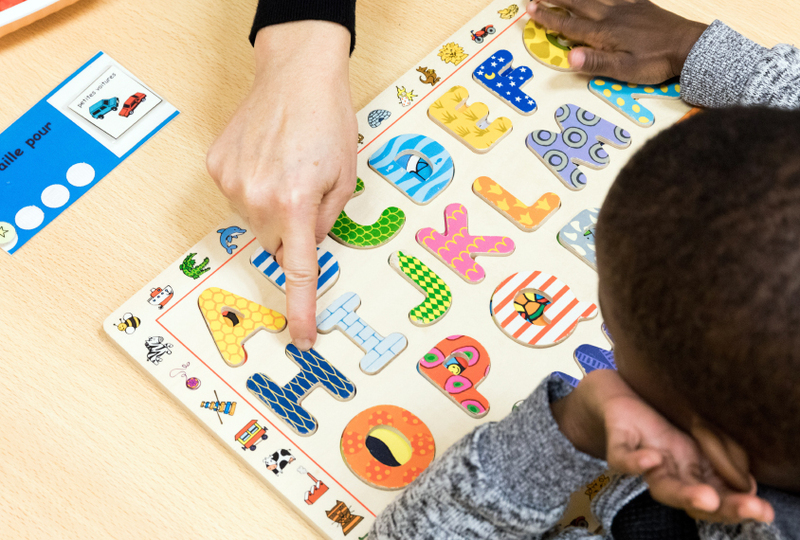 Elementary moves: Few schools in France provide behavioral therapies for children with autism. Responding in part to these high-profile criticisms, the French government has taken small steps in the right direction. In 2005, several government ministries issued a memo calling for an ‘autism plan.’ That first plan offered new screening and diagnosis recommendations for autism. It also created ‘Autism Resource Centers’ in each of the nation’s administrative regions to screen children for the condition and offer advice to their parents about possible treatment options, financial help available, and so on. Also around that time, France’s official manual for diagnosing psychiatric conditions in young people, the “Classification Française des Troubles Mentaux de l’Enfant et de l’Adolescent,” stopped defining autism as a psychosis, bringing it in line with international diagnostic standards. Two subsequent government plans introduced specialized teaching units within some mainstream schools. They also added more regional centers and stepped up efforts at the centers to make earlier diagnoses. But parents, scientists and advocacy groups say those plans didn’t go far enough — in part because of a lack of oversight. They are pinning their hopes on a fourth initiative that is under development. Details on this new ‘Plan Autisme 4’ are slim, but two key aspects are measures to increase access to specialized classrooms, and better job training and housing options for adults on the spectrum — who were largely left out of the previous plans. To explain why autism services in France lag behind those in other countries, many experts point to the nation’s long-standing ‘autism wars.’ For decades, those favoring psychoanalysis for treating autism (mostly psychiatrists) have been locked in a heated debate with those who support evidence-backed behavioral therapies (mostly parents and scientists). Psychoanalysis is a “dictatorship of thought” in France that, over the past 40 years, has become part of the national culture, Langloys says. In the 1950s, there were only about 150 psychoanalysts in France, compared with thousands in the U.S. By the early 21st century, though, the number in France had soared to about 10,000 — with a sharp increase during the late 1960s connected to a rise in anti-establishment politics. “Medicine was part of the establishment,” anthropologist Roy Richard Grinker explains in his 2008 book, “Unstrange Minds: Remapping the World of Autism.” By contrast, psychoanalysis was seen as a way to empower individuals against institutions. Also in the late 1960s, the Austrian-American psychoanalyst Bruno Bettelheim published “The Empty Fortress,” which instantly became influential in France. In that book, Bettelheim noted that some characteristics of autism — a hesitancy to make eye contact, repetitive behaviors, a shuffling gait — were similar to what he had observed in concentration camp prisoners during World War II. He concluded that these characteristics arose from emotional deprivation. In the case of autism, he lay the blame on emotionally cold ‘refrigerator mothers.’ Around the same time, French psychoanalyst Jacques Lacan blamed overbearing ‘crocodile mothers’ for their children’s autism. The idea of blaming parents is taboo in the U.S. and elsewhere — with good reason, as it has been “rejected and debunked for 50-plus years now,” says Mayada Elsabbagh, assistant professor in psychiatry at McGill University in Montreal. But it prevailed in France, as Miriam Sarbac, founder of the parents’ group Asperger Amitié, discovered firsthand. In 1995, she noticed that her 2-year-old son, Raphaël, had stopped talking and making eye contact. A teacher at his nursery school recommended a psychiatrist, who credited Raphaël’s “developmental troubles” to the fact that Sarbac was “stressed.” Sarbac had to stay in the waiting room during Raphaël’s twice-weekly sessions, which didn’t seem to help. A psychologist later diagnosed Raphaël with autism when he was 14. Baby steps: Camille Schneider heads a teaching unit for students with autism that was launched three years ago. In 2011, a large, systematic meta-analysis of early interventions for autism found no evidence supporting a psychoanalytic approach for the condition. Yet if French parents oppose it, they can face dire consequences — including the forced removal of their children to institutions or foster homes. Langloys says social workers can label a family as troublesome just for seeking out a second opinion. “Social workers know nothing but psychoanalysis, so for them the mother is always too fused or too cold,” she says. To them, she says, “it’s normal to take away her children.” Her association has counted several hundred cases of children being separated from their parents in the past 15 years. In 2014, Autisme France began offering its members access to legal aid services to help families facing court proceedings to remove their children. Down the labyrinth of pale yellow corridors at École Maternelle Publique Surmelin, a nursery school in Paris, is classroom number 5. It’s a cozy space, filled with books, toys, art supplies — much like the other classrooms. But there are subtle signs that classroom number 5 is different: In the class photo pinned to a board at the entrance, the adults outnumber the children. The room has thick yellow curtains to block out bright sunlight and shelves loaded with headphones to mute intrusive sounds. It also features several dedicated quiet zones, where students can spend one-on-one time with a teacher. This classroom hosts a special teaching unit for children with autism, launched just three years ago. The school serves almost 150 children, aged 3 to 6, but has only seven spots for preschoolers with autism. The children all go to some regular classes with others their age, but can retreat to the safety of classroom 5 at any time. The classroom is staffed with a variety of therapists, a psychologist and several teachers trained in ABA. How often each child attends mainstream classes depends on his or her needs, which are reviewed on a weekly basis. But because the other classrooms are nearby, it’s easy to make quick adjustments, says Camille Schneider, who heads the special unit. Schneider calls her teaching unit “a little piece” of the third national autism plan in France. That 2014 initiative spurred the creation of 110 such classrooms across France — meaning only a few hundred of the youngest children with autism in the whole country have spots. The majority of children with the condition are still not integrated into mainstream schools. Instead, they are often educated at day hospitals or other quasi-medical institutions, where, according to Rogé, they are usually left in a group while “the teachers go smoke their cigarettes or drink their coffee.” Rogé is quick to add that some day hospitals have valuable programs. But what’s needed, she says, are thorough evaluations to distinguish the good places from the bad, so that public funding can be directed accordingly. It’s late morning when a quiet 4-year-old from the classroom follows her red-haired teacher, Claire Douay, down the maze of Surmelin’s corridors to an exercise room. The space is vast, with broad wooden beams supporting a vaulted ceiling. Another 19 children aged 4 or 5 from regular classes are already there, sitting quietly on the low benches lining the walls. The gym teacher, a young man with a thick beard, explains the first exercise to the children: Pretend to be ducks and walk in rhythm with the music. The little ones leap up eagerly and begin duck-walking around the room. The girl from classroom 5 lies flat on the floor and stares at the ceiling. Douay is right beside her, enticing her to stand up and showing her how to be a duck. The child follows, but loses focus within seconds. Douay patiently starts over. 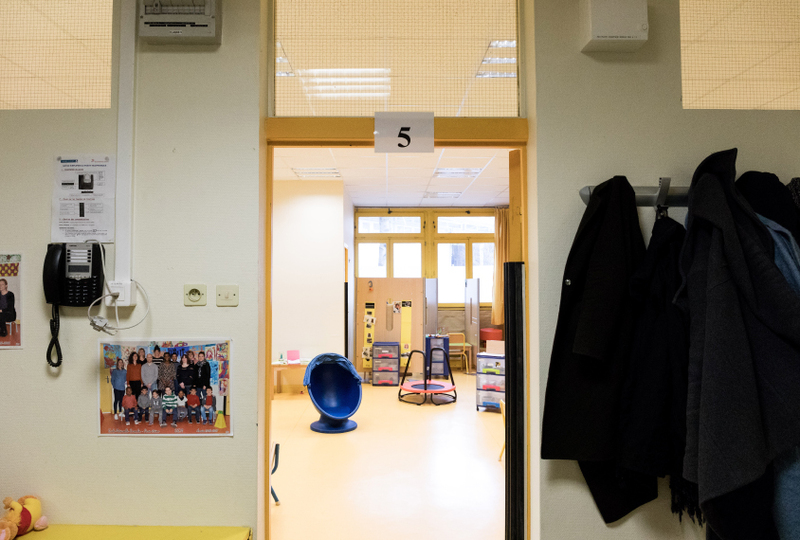 Classroom number 5: This special unit offers support to seven children with autism at a school in Paris. This school’s students with autism are among the lucky few in mainstream education to have teachers, like Douay, who are trained in ABA. The French government employs an estimated 50,000 ‘auxiliaires de vie scolaire’ (school aides) to accompany students with special needs, including autism, but these aides often have no autism training. There are also not enough of the aides to support all the children on the spectrum in France, Glover-Bondeau says. To close that gap, some parents pay out of pocket to have trained aides work with their children. Glover-Bondeau has spent thousands of euros over the years on courses to have people who accompany her son in school certified in ABA. “If you don’t have someone who accompanies your child, then obviously you have the right to put him at school, but as a parent you don’t want to put him in this situation,” she says. In fact, many schools refuse to admit children with autism who have no aide to help them in class, Sarbac says. Since 2005, all children with autism have the right under French law to attend mainstream schools, but in practice many are still shut out — sometimes literally. Sarbac says she gets emails and calls from parents whose children have been barred from school: “They say, ‘What can I do, the director doesn’t want to keep my son in school.’ I tell them, ‘You can refuse … they have to accept your child.’” Many parents have little recourse, however. In 2014, French media buzzed with the story of Timothée Dincher, a teenager from Lyon who, at the beginning of a new academic year, was denied entry to his school. Dincher’s mother posted a YouTube video of a heated exchange she had with the headmaster. Before the video was removed in September 2017, it had 1 million views. Sarbac says her son’s lack of options felt so oppressive that at one point she considered moving her family to the U.S. She ultimately changed her mind, but according to a 2016 report from one French government agency, hundreds of children on the spectrum may in recent decades have left France for Belgium, where educational options and behavioral therapies are more readily available. Fewer people are escaping to Belgium as services in France slowly improve. “There has been a lot, a lot of progress,” Rogé says. Before the 1990s, for example, the average age of diagnosis in the country was about 10. As of 2014, an online survey of several hundred parents reported that their children were diagnosed, on average, at 57 months, compared with 56 months in the U.S. Since FuturoSchool opened in 2004, the government has funded 29 similar facilities. France’s psychiatric manual for young people is now better aligned with international diagnostic standards, after the introduction of ‘autism spectrum disorders’ as a diagnosis in 2010. And researchers and families are lobbying for an ambitious range of further gains. In July, 13 young people with autism, ages 7 to 21, met President Emmanuel Macron and his wife at their residence, the opulent Elysée Palace in Paris, to kick off the Plan Autisme 4. The event marked the start of an initial six-month consultation that addressed goals such as improving school inclusion for children after preschool, encouraging more research, training more professionals and meeting the needs of adults on the spectrum. Several nonprofit advocacy groups, such as Alliance Autiste and Autisme France, have published long lists of additional suggestions — including better teacher training, better job coaching for adults with autism and complete reimbursement for the services of psychologists and other kinds of therapists. So far, the government has announced a few changes: In July, Sophie Cluzel, the secretary of state in charge of services for people with disabilities, promised that the monthly disability allowance for adults, including those with autism, would be raised by 10 percent, to 900 euros a month. In December, she created another 11,200 positions for school aides to accompany special-needs children at school. It might also help loosen the grip psychoanalysis has long had on autism in France. Although the condition is frequently idiopathic, meaning it has no clear cause, its connection to specific genetic mutations offers irrefutable proof of its biological origins. Positive change: French children with autism are only beginning to gain access to proven behavioral therapies. This article was republished in The Independent. Great article, thank you. Psychoanalysis for autism, mum-blaming and “Le Packing” should be consigned to the dustbin of history, and evidence-based therapies such as ABA made available on a state-funded basis. Well done to this dad. My own precious beautiful boy has benefited so much from an ABA education here in the UK. The controversy about it is wholly misplaced. The idea of blaming parents is taboo in the U.S. and elsewhere — with good reason, as it has been “rejected and debunked for 50-plus years now,” says Mayada Elsabbagh, assistant professor in psychiatry at McGill University in Montreal. Autism has many etiologies. Several forms have been shown to result purely from heritable and random mutation genetics. Good research also routinely confirms, genetics and environment contribute on similar orders of magnitude in causing Autism, in other as yet poorly understood etiologies. Emotional abuse and severe neglect are environmental factors. Betelheim and Kanner were clearly wrong, insofar as they claimed *all* of Autism is caused by abuse and neglect by care-givers. Contemporary Autism specialists are also wrong in continuing to follow Rimland, and claiming *none* of Autism is caused by care-giver maltreatment. Long-term research by Rutter and others, clearly documents symptomatic etiologies which do classify as Autism, in many children who have suffered severe long-term privation, whether in maltreatment of orphans in institutions, or in feral “home-life” of kids struggling to survive with horrible unfit mothers and/or fathers. In cases where documented histories of severe privation exist, children “earn” a label of “Quasi-autism”. All too often, however, documentation of what these children suffer fails in ways reminiscent of the worst abuses of our shameful Eugenics era. Wherever documentation of neglect fails, children are lucky to get any help whatsoever. And help often includes *medicalization* of child maltreatment into Autism. Removal of autistic children from parents is rife, in a child protection industry that already goes way too far for the average family. My baby appeared ‘normal’ after her birth. The actual birthing process was not easy, she became ‘stuck’ (something I expressed concern for prior to the beginning of the birthing process) and I vigorously requested a Cesaerean, which my (male) obstetrician initially resisted (I feel for too long). However, that being said, when she did begin to crawl, she did not crawl ‘normally’. She crawled only on her left knee, with her right leg in an almost crouching position. I since learned this is one of the early warning signs of Autism Spectrum Disorders. Our pediatrician had little to no knowledge of ASD, which did not help. It is imperative,i was on internet searching for autism remedy, then i saw testimonies of how DR CHALE used his herbs to help autistic children without side effect on the child, i then contacted him with his email: (chalesolution@ yahoo .com). He told me that i am in the right place, and he ask me some questions about my child and i told him. i was asked to get his herbal remedy and instructed me on how to administer it, which i did, as am writing this testimony now, there is nothing she cannot do, plays, this is all i ever wanted. we just want to thank him for he is really a man of his words.